Back when immigration was mostly from England, Maynard was not an uncommon surname in the American colonies. Glenwood Cemetery has eleven Maynards not closely related to Amory Maynard. Per the very entertaining website www.howmanyofme.com, typing in “Maynard” as a last name yields 43,332 people in the United States with that name. Far fewer than (2.9 million) or Jones (1.7 million), but not rare. Several of them loaned their names to towns other than Maynard, Massachusetts (2010 census population 10,106; area 5.4 square miles; founded 1871; named after Amory Maynard). Maynard, Iowa (pop 518, area 1.02 sq. mi.). Henry Travis Maynard moved from Illinois to Iowa in 1861. Other people settled there, in a community that came to be known as Long Grove. The Burlington, Cedar Rapids and Minnesota Railroad reached the area in 1873. As there was another Long Grove elsewhere in the state, a state judge decreed that this Long Grove would be named “Maynard” mainly because Henry Maynard (1816-1903) had donated the land needed for the railroad station. Official incorporation took place in 1887, but the town celebrates its founding as 1873. Henry Maynard is buried in the Long Grove Cemetery, as are his second wife and seven of his nine children. Maynard, Minnesota (pop 366; area 0.65 sq. mi.). The city was platted in 1887 by John M. Spicer, a land developer and superintendent of the Great Northern Railway. A plat is a map, drawn to scale, of the divisions of an area of land. Once platted, lots can be sold. Maynard was named in honor of Spicer’s sister's husband: Grayon Gates Maynard. (Spicer also named the villages of Raymond, Russell, and Ruthton after his children, and the town of Spicer after himself.) Maynard was incorporated on January 8, 1897. A meander through genealogies traced the namee back to a John Maynard (1630-1711) – born in England, died in colonial Marlborough – the great-great-great-grandfather of our Amory Maynard. Capt. John Maynard of Maynard, AK. Maynard, Arkansas (pop 426; area 1.1 sq. mi.). John Maynard, formerly a captain in the Confederate Army, spent some time in Texas before moving to Arkansas in 1872, where he opened a dry goods store, and farmed 900 acres, mostly cotton. Other families and businessmen joined him in the village they called New Prospect. When they applied for a post office in 1885 that name was rejected and the office was named ‘Maynard.’ The town incorporated as Maynard in 1895. 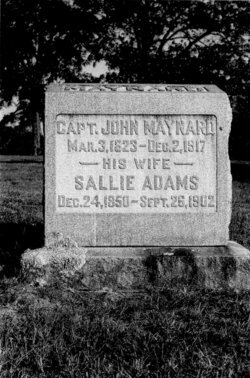 John Maynard died in 1917 and is buried in the Maynard Cemetery next to his wife Sarah “Sallie” Maynard, who was 27 years younger than her husband. Maynard, AR, is home to Maynard High School, mascot a tiger, school colors black and gold. I mentioned this seemingly obscure trivia to a group of our high school students who were volunteering at the recent OARS-organized annual Assabet River clean-up, only to learn that it is common knowledge at our Maynard High School that it has a doppelganger elsewhere. Maynardville, Tennessee (pop 2,413; area 5.4 sq. mi.). Maynardville is the county capital of Union County, TN. It began as a small community named Liberty. When Union was proposed as a county, Knox County, being called upon to give up some of its land, opposed. A lawyer named Horace Maynard (1814-1882) successfully defended the proposal, so the town was later renamed in his honor. Maynardville dates it founding to 1870. Horace went on to be a Congressman representing Tennessee, and later Postmaster General for the U.S. Postal Service. Interestingly, he and Amory Maynard were both great-great-great grandchildren of John Maynard. Amory and Horace were both born in Marlborough, MA, Amory ten years earlier, so very possible that they knew each other. In conclusion, three of the five namesake communities (MA, MN, TN) were named after descendants of John Maynard, who crossed the Atlantic with his father when he was eight years old. All were so-named when the men in question were still alive to appreciate the honor (or in Amory Manyard’s case, to dictate the honor). Maynard, Texas (population ~100). Post office named "Maynard" in 1880, but this area about 60 miles north of Houston was never incorporated. Population dipped as low as ~25 after World War II, but rebounded a bit with renewed oil well activity in the area. Two churches and three cemeteries. No information on how it got its name. Maynard, TX might have been settled by free Blacks after the Civil War. Maynard, Ohio (population unknown). Unincorporated community in eastern Ohio, tentatively identified as named after Horace Maynard (see Maynardville, TN) when a Post Office was established in 1880. Currently has a post office and zip code. Other: There are Maynard-named neighborhoods within towns in at least a dozen other states.